I Challenge you to play BETTER! Things have been pretty quiet on the blog lately. We’ve been busy, busy, busy here enjoying family and vacationing. Now we’re back home and settling back into our routines. Seems like a perfect time for a challenge, doesn’t it? You know I’m a big fan of Playful Parenting, so when I spotted the 30 Days to Hands on Play Challenge I knew I had to do it! I hope you’ll join me. Anna from The Imagination Tree and Jamie from Hands On: As We Grow have come up with a challenge for each day to encourage you to get out of your old routine and get focused on playing with your kiddos. You’ll be focused on play for an uninterrupted 15 minutes a day. They’ll introduce you to new ideas and you’ll have fun along the way. So I’m a few days late joining, but I think I can catch up. I’ll try to post my updates with the challenge at least once a week. The challenge for the first day is to write a mission statement for how you want to become more hands on with your children. Take note of what interests your kids, this will be helpful for future challenges. I want to be more mindful when playing with my children. Look in their eyes, follow their lead. I’d like to include my husband in this challenge and truly make it for the whole family. His work schedule has recently changed, and this will be a good way to start some positive play patterns in his routine. Big Z loves to play with animals and recently has an interest in playing spy. 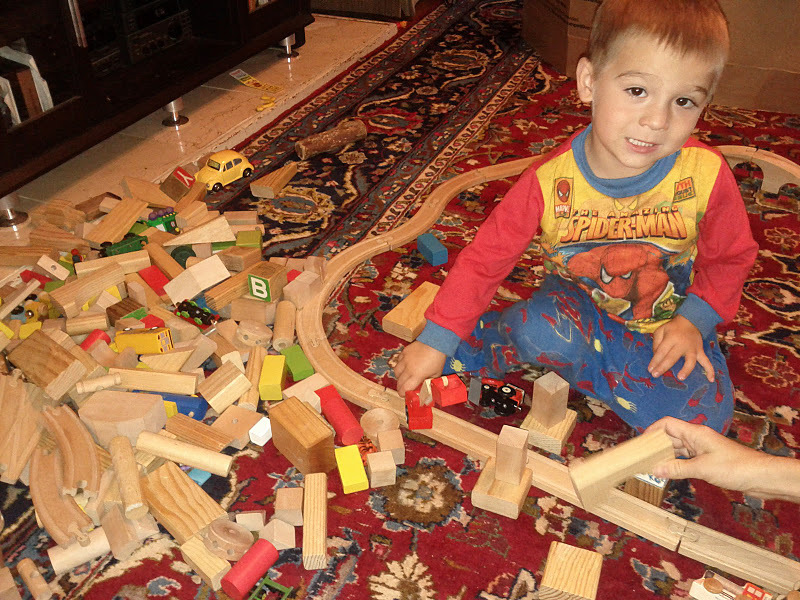 Lil’ Z LOVES trains, blocks and trucks. Day 2 is all about building forts. Get involved with your wee ones, use blankets, chairs, boxes and most importantly your imagination. This is an easy one for us. 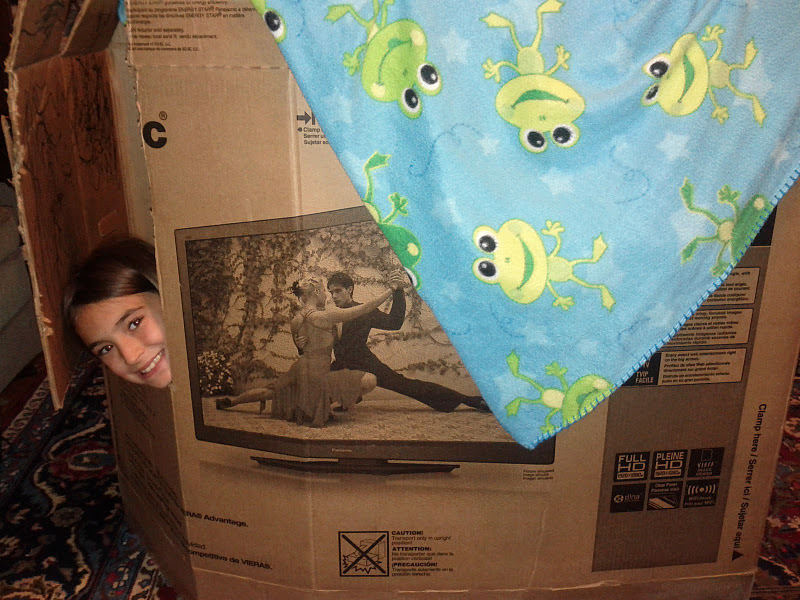 We’ve already built a fort from our dining room chairs and blankets and a fort from a big old box this week. 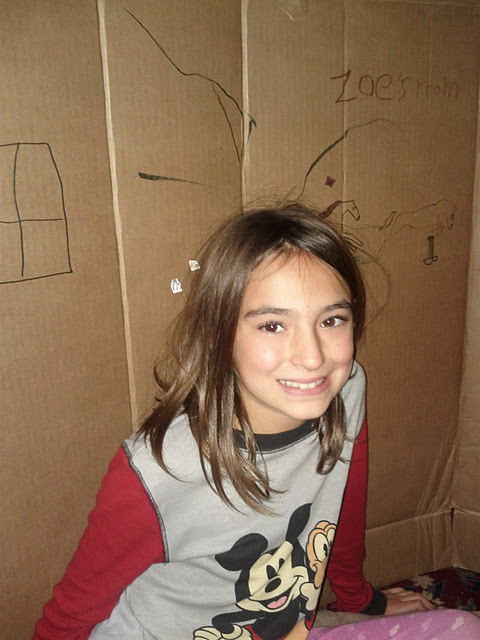 Lil’ Z was over zealous in decorating the inside of his fort and decorated himself in the process. Day 3 offers the challenge to get down on the floor and play blocks! We love wooden blocks and lego’s around here. So they are usually sprawled across the floor at some point in the day. Today is Day 4 and this is Island Day! Get your pillows or foam pieces and spread them across the floor. Now hop, jump or stretch to make your way across the room on these little “islands” you’ve created. Sounds like fun. Ok, my little one is saying “Come play with me!” Guess I better go! I’m so glad you and some of my other favorite blogs are participating in this challenge. I’m learning a lot. If I wasn’t already overloaded, I’d be doing it too. But, I’m reading along with your experiences and learning. I’ll put it into practice on a daily basis, I’m sure! Never too late! And I”m glad you’re jumping in! Have fun jumping islands today!